A quantitative analysis of the total cost of ownership of two datacentre architectures – traditional facility and the modular datacentre – has found that the pre-assembled, datacentre modules provide 30% more savings than a traditional brick-and-mortar facility. The white paper from Schneider Electric, which compared the two architectures, found that modular or containerised facilities allow businesses to scale and fit the datacentre to meet capacity and load demands. This, when combined with efficient power and cooling techniques, results in TCO savings of nearly 30% over a traditional datacentre (27.2% savings on capital expenses and 31.6% savings on operating expenses). Traditional datacentre designs incorporate excess capacity upfront to meet future capacity requirements. This is because subsequent expansion of power and cooling capacity is difficult and costly in a production datacentre and may result in downtime during the expansion. “This often has the effect of people being overly conservative in capacity planning which results in higher upfront capital costs and a chronically inefficient datacentre,” said Wendy Torell, senior research analyst at Schneider Electric’s Data Center Science. Modular datacentres, on the other hand, eliminate the need to build oversized facilities for future capacity requirements because pre-build, standarised datacentre pods can be bought to meet the excess demand. A modular datacentre is different from a traditional datacentre in that it is a portable infrastructure designed for rapid deployment, energy efficiency and high density. It can be shipped and set up anywhere that has power source, network connection and cooling equipment. It also helps businesses save time and cost in building their own datacentre. “Modular architecture makes adding or reducing capacity to meet real-world, dynamic demand much easier,” Torell explained. These datacentres also lend themselves to more efficient cooling techniques to help save on ongoing energy expenses unlike traditional datacentre infrastructure that use traditional, inefficient air-conditioning units. The white paper provided a 10-year operational cost breakout comparison between traditional and modular approaches for a 5MW (megawatt) datacentre build. It looked at the power usage effectiveness (PUE) of each as the datacentre is built out, and provided a guide to energy savings potential. Last year, a research from DCD Intelligence revealed that a modular datacentre may cost an enterprise 14% less to deploy than building a traditional bricks and mortar datacentre. There has been a lack of clarity in recent years when it comes to the comparative cost of traditional and modular datacentres, but the DCD research found that the greater density and more efficient use of space mean that modular facilities are able to achieve significantly better PUE compared to traditional datacentres in many cases. One company that has saved costs and improved energy efficiency in datacentres is Capgemini UK. 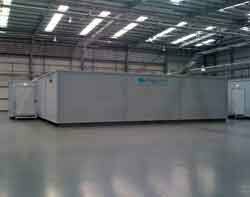 Its Merlin datacentre in Swindon is built using a modular approach. Rather than building out a 3,000 square metre datacentre to meet its current and future requirements, complete with all the infrastructure required, Capgemini adds datacentre modules containing data racks every time there is demand for additional capacity. Currently, the facility has a PUE of between 1.03 and 1.07 and its modular design has won it the 2013 EU Code of Conduct for Datacentres award for datacentre innovation and energy efficiency.